Only approximately 20% of Americans have engaged in any form of advance care planning and, even among older Americans, the process frequently is delayed until an acute illness provides sufficient pressure to act. 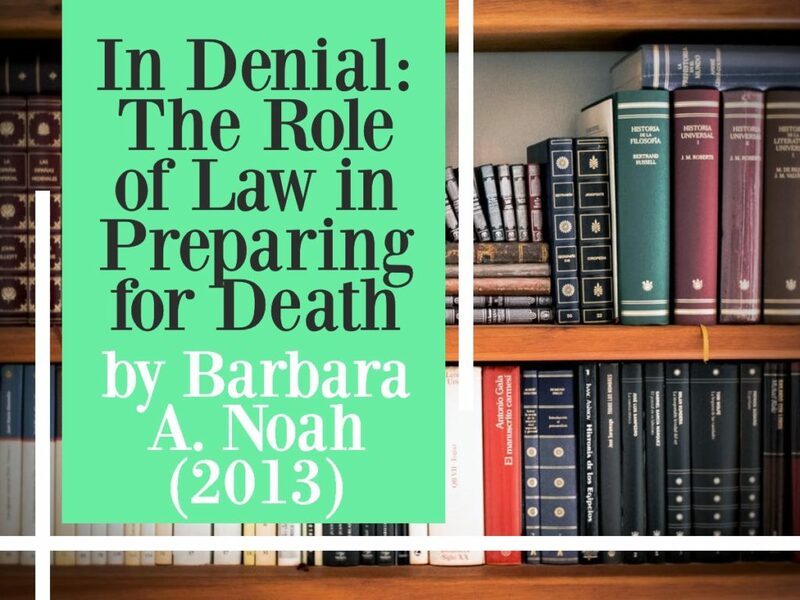 End of life law, though flawed, offers some opportunity to express individual values and preferences via advance directives of various kinds in order to prepare for death before it is imminent. Yet many people avoid making these preparations because the thought of death is uncomfortable to confront. This Article considers the utility of existing law in preventing and resolving end of life disputes and avoiding over-utilization of life-prolonging technology and the law’s inevitable failure to address complex issues concerning quality of life and communication about this inevitable but usually unpredictable event. The so-called technological imperative and the cultural admiration of those who “fight” and “do everything” to defeat illness have created an atmosphere in which physicians and patients often feel complementarily reluctant to engage in thoughtful discussions about the patient’s values, preferences, and concerns or, worse, even to acknowledge openly the fact of the patient’s dying. In addition, the presumption in favor of continued treatment for patients who have lost decisional capacity has created a situation in which patients are frequently subjected to multiple therapeutic and life-supportive technologies that they would not wish for if they could make the choice. This lacuna of unconsidered choices suggests a significant need for formal expressions of end of life preferences, or at least serious conversation with family and health care providers about one’s preferences. The law allows individuals to express their preferences on these matters, but creates little incentive to do so. As other commentators have noted, advance directives rarely resolve end of life disputes—these commentators have therefore suggested abandoning efforts to encourage the utilization of advance directives. There is, however, a compelling argument in favor of continuing and expanding the practice—namely, the inherent and immediate benefit to the individual of carefully and systematically thinking about and executing an advance directive or, at least, discussing preferences with a health care proxy. Laws encouraging advance directives provide a structural context in which individuals can acknowledge their mortality and make the effort to consider and articulate to themselves and others their values and preferences, resulting in much potential benefit to themselves, their families and their health care providers, not only at the end of life but throughout life. Regularizing this practice throughout adulthood may gradually reduce the impact of the technology juggernaut on the dying process. This Article concludes by examining the ways in which end of life law and the medical education system might be reformed to promote individual reflection and conversations between patients and physicians in order to prepare for death. Professor of Law, Western New England University School of Law; J.D. Harvard Law School. This work was supported by a research grant from Western New England University School of Law. The author would like to thank René Reich-Graefe for his insightful questions and comments during the various stages of this essay’s development and Renée Rastorfer for her research assistance. This work may not be cited or reproduced without the permission of the author. Copyright © 2013 by Barbara Ann Noah. Click here to read the full article in PDF.